Dr. Ben Chew specializes in the surgical and medical treatment of kidney stone disease. Originally from Vancouver Island, he graduated from UBC Medicine in 1998 and completed his urology residency at the University of Toronto in 2003. His fellowship focused on kidney stones and minimally invasive surgery at the University of Western Ontario. Dr. Chew’s research focuses on how kidney stones form and in particular how we absorb certain compounds and minerals through the intestinal tract. By altering how we absorb compounds, his research hopes to be able to change a patient’s risk factors for developing more stones. 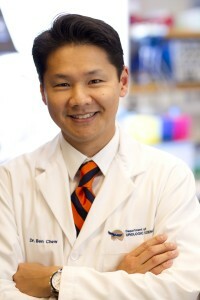 Dr. Chew’s other area of research is in the area of biomaterials as they pertain to urinary devices. He is investigating new coatings and special drug-eluting materials for urinary catheters and ureteral stents in an attempt to make them more biocompatible and reduce device-related infection, encrustation, and patient discomfort. Dr. Chew has published over 50 peer-reviewed articles and received several awards including the best Endourology Paper Award at the World Congress of Endourology in 2009, the best Research Paper at the World Congress of Endourology in 2010, the Best Abstract Prize for Stone Disease at the American Urological Association Annual Meeting (2005 and 2008) and most recently a Michael Smith Foundation for Health Research Scholarship. In 2011, he was awarded an Exchange Scholarship from the Canadian Urological Association and European Urology Association. He is also a Canadian Urology Association Scholarship Foundation recipient in 2007 and 2008. In 2017, he will be the Co-President of the World Congress of Endourology international meeting to be held here in Vancouver, BC. He teaches other urologists internationally with lectures and hands-on laboratories as part of an initiative, The Stone Institute, to help improve the care of patients all over the world.